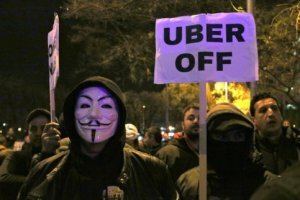 Uber has threatened to pull back from Barcelona after the Catalan government unveiled new regulations which will severely restrict ride-hailing services, as taxis upped the pressure with a restive strike. The US giant, which has seen conflicts in other European countries as taxis complain of threats to their livelihoods, said that if the rules are approved as planned next week, ‘We will not be able to continue providing our UberX service in Barcelona’. That is the cheapest Uber ride and commonly-used in Spain where UberOne, a more expensive premium service, also operates. The news comes as taxis strike in Madrid and Barcelona against tourism vehicles with chauffeur or VTCs such as Uber or Cabify. In Madrid, the work stoppage coincided with the start of FITUR, one of the world’s biggest tourism fairs. Hundreds of drivers protested at the convention centre, blocking the road in front, burning tyres and a dustbin. Spanish taxi drivers complain that rivals from ride-hailing apps are acting as taxis despite not being classed as such in the law, competing unfairly since they do not face the same regulations and costs. The new Catalan government regulations, unveiled on Friday, seek to address this and restrict VTCs. But they failed to satisfy taxis or ride-sharing services. If they come into effect, the rules will oblige Uber or Cabify customers to book their services 15 minutes in advance. That means these customers will have to wait 15 minutes before they can get a ride rather than the near-immediacy with which VTCs currently arrive. But taxi drivers say that’s not enough and want them to be booked 12 to 24 hours ahead of time. They have been on strike since Friday. On Tuesday, the regional government said it would allow local authorities in Catalonia – if they deemed it necessary – to lengthen that pre-booking time ‘to a maximum of one hour’, a spokeswoman said. That one-hour time delay will be applied in Barcelona, Mayor Ada Colau told reporters. The new regulations also ban geo-localisation for VTC services, meaning users will no longer be able to find the car nearest to them on their app. For VTCs, the measures are drastic. In Barcelona alone, there are 2,134 VTCs according to Damia Calvet, in charge of territorial matters in Catalonia. That compares to 10,523 taxis in the city, according to the Municipal Taxi Institute. Back in Madrid, taxis continued to demand VTC restrictions. On Wednesday morning in front of the FITUR convention centre, they had painted the slogan ‘VTCs aren’t taxis’ on the asphalt, and shouted ‘Yes we can’ and ‘Taxis united will never be defeated’. ‘They’re fighting for what they believe is fair and we are too,’ he said. The strike has seen sporadic clashes. Unauto VTC said 80 VTCs had been damaged in Barcelona and 50 in Madrid during the strike.